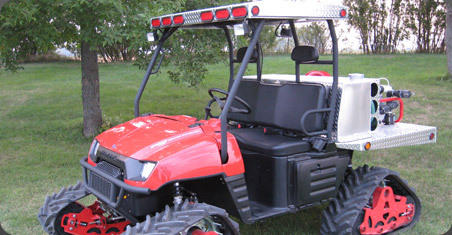 The Fire RANGER is specially designed for grassland and forest area fire fighting. NorthStar Specialty Vehicles provides vehicles for off-road applications and customers requiring special adaptations and modifications to meet their unique needs. We work with Polaris dealers and the customer to understand problems and creatively find solutions that work. NorthStar works with Polaris recreation and utility vehicles as base vehicles, specially equipping and modifying them to the specifications developed with you. Spanking new videos of the Fire RANGER and Saratoga RANGER in action. Take a look and see what these vehicles can do for you. James Bergman's experience is extensive and includes projects with Polaris, the U.S. Military and others. James is ready to use his creativity to find your solutions and his manufacturing expertise to make it a reality. If you'd like to learn more and discuss your unique off-road needs, please contact us. We're ready to help. ©2007 NorthStar Specialty Vehicles, LLC. - All rights reserved.